Long before the Cracker Jack® snacks, before the bat crack claps back, sending a once-hushed crowd into fevered chants, before the excitement, before the glory, before the lights even come on — a solid grounding must be built. It’s built in the roster. It’s built in the fans. And it’s built in the actual playing field by the highly regarded Bush Sports Turf of Milan, Illinois. 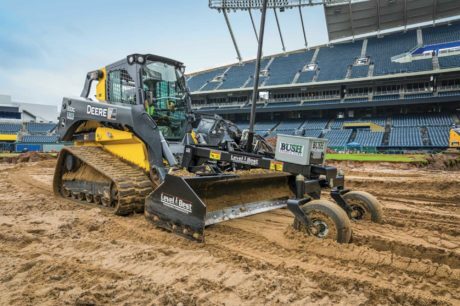 Renowned general contractor Steve Bush of Bush Sports Turf uses John Deere equipment to meet his projects deadlines. Hear about some of his most hectic weeks and the logistics involved. The rain is relentless, but so too are owner Steve Bush and his dedicated crew. 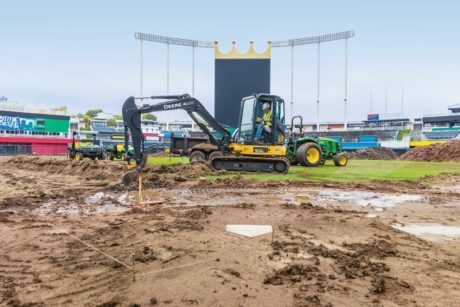 They’re only a few soggy days into their latest project at the Kansas City Royals’ Kauffman Stadium, and already a quarter of the field is up ’n’ outta there. And while this seems fast-paced to an outsider, the job is a changeup for the crew. 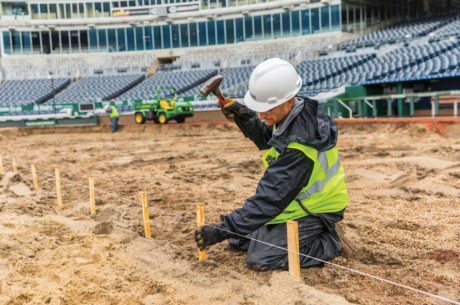 Most often working on baseball and football fields, Bush’s projects vary in scope and complexity, and on this job, there is plenty to do. 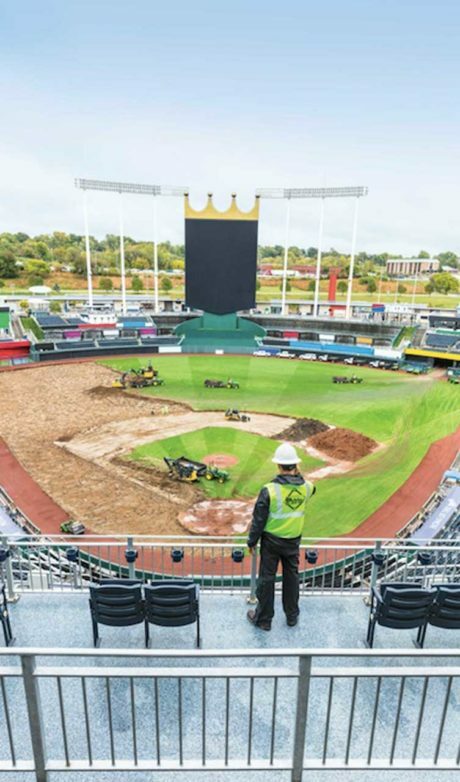 “This is a complete renovation of the field. Over time, these fields mature, and even though they look beautiful to most people, the roots start decaying and plugging the growing medium, so the water doesn’t drain properly and the overall field is not as healthy.” This makes it a challenge for the groundskeeper to manage. With such success and high praise, one would think Bush had his eye on this type of work from a young age. Lucky for you, the truth is far more interesting. “I went to school for agronomy and planned to be a farmer, but that market tanked in the mid ’80s, so my wife and I got into landscaping. I bought a grass seeder and was seeding old ladies’ yards until I heard John Deere was going to build a golf course. I started driving out there every day and finally found a guy with the PGA® and told him I could help build the course. He said to give him a quote, so that meant I had to go to the library and learn how to build a golf course first. With jobs all over the country, Bush appreciates the robust Deere dealer network. 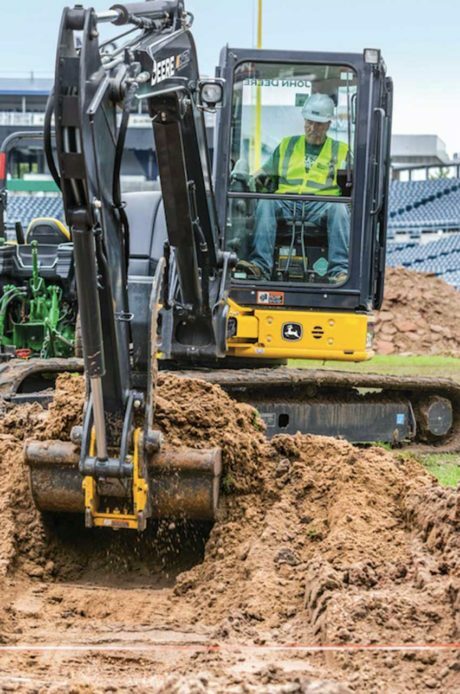 If you enjoyed reading this story, you might also be interested in these John Deere Journal stories.